We have installed a new automated check-in screen at both sites Gubbins Lane & Ardleigh Green. It is hoped that this will reduce queuing in the reception area. Using the screen is easy and there are clear instructions but if you would rather speak to a receptionist please do so. The reception team will help you if you have any queries. If you have an urgent medical problem and you are unsure of the correct course of action to take, PLEASE DO CONTACT US FOR GUIDANCE IN THE FIRST INSTANCE. In people over the age of 65 an irregular pulse can contribute to causing a stroke. We are now starting to screen people for this. If you're over 65 and no-one has checked your pulse then please ask your doctor or nurse to do this next time you see them. People found to have certain kinds of irregularity will be offered an ECG and possibly medication to help prevent a stroke. HAVE YOU HAD YOUR FLU JAB? THIS WINTER PROTECT YOURSELF FROM FLU - SEE OUR NOTICE BOARD FOR FURTHER DETAILS. NHS 111 for medical help fast but it’s not a 999 emergency. Everyday life can be tough for anyone. Our talking therapies for Barking and Dagenham, Havering, Redbridge and Waltham Forest are free, confidential NHS services that can help with a range of problems such as depression, anxiety, stress, bereavement and relationship problems. Formerly known as IAPT (Improving access to psychological therapies), our Talking Therapies services are confidential and easy to access. Simply complete the online patient referral or call us direct on one of the numbers below and we’ll arrange an initial telephone appointment. Together we will decide the right treatment for you, if we feel that another service will better be able to support you will provide you with the necessary information or make the referral for you. Talking therapies are proven to work, and our friendly, professional teams offer a range of sessions that are designed to help you cope better. Call us between 9am and 5pm, Monday to Friday and we will book you an appointment for an initial assessment. Outside of office hours you can leave your name and contact details on our answerphones and we will phone you back as soon as we can. 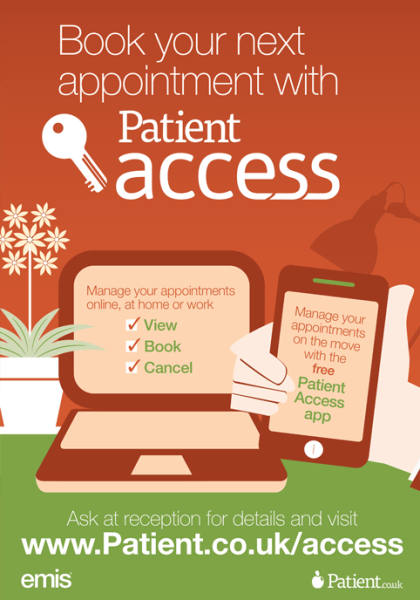 Enabling patients to book appointments, order repeat prescriptions and view their medical record online. It provides a 24-hour online service that gives patients more flexibility and saves time for practices. Existing registered patients have all been emailed details on making the switch. Patients who have provided email addresses at registration have all also been contacted recently with details of this great service. Click here to register or login. So that we can protect funding for the most essential NHS services for local people – things like emergency and cancer care – maternity and mental health services, your local NHS has stopped funding and prescribing some medicines and procedures. Travel vaccinations - Your GP can no longer provide these travel jabs on the NHS: Hepatitis A and B combined, hepatitis B, meningococcal meningitis, Japanese encephalitis, rabies, tick-borne encephalitis, TB, yellow fever. Restricting who is eligible for cataract surgery and podiatry. Unfortunately, no change is not an option, and it’s up to us – with the public’s help – to get the local NHS onto a secure and sustainable footing to make sure we can maintain those vital services for you and your families. We know some of these decisions won’t be popular, but we have to look at where we can save money so we can protect priority, lifesaving services for all. Barking and Dagenham, Havering and Redbridge Clinical Commissioning Groups (BHR CCGs) have decided to restrict or no longer fund some treatments, medicines and procedures. This included hayfever medication from 8 January 2018.
sneezing, a runny nose and itchy eyes. Hayfever treatments are widely available at low cost from supermarkets, pharmacies and other retailers. Walk-in centres – Our walk-in centres are open to patients, including children, every day of the year (and most are open on Christmas Day). You do not need an appointment and can just “walk in”. Find more information on the centres’ locations and opening hours. Urgent GP appointments – Urgent, same day, bookable appointments are available every day at GP hubs across the borough between 6.30pm and 10pm on weekdays, and between 8am and 8pm on Sundays. To find out more on urgent GP appointments call NHS 111 or 020 3770 1888 to book an appointment. So that everyone can get the treatment and advice they need, it’s important to remember that A&E should only be used by people with serious or life-threatening health problems requiring emergency treatment. Our patients can now benefit from free complementary WiFi at our Gubbins Lane and Ardleigh Green branches. Please ask at reception for details.